I have wanted to play the guitar since I was about five years old. My mom plays, and I remember pages of sheet music strewn about her as she gently strummed chords and sang in her flute-like voice. She also used to accompany the family on Christmas Eve as we sang carols, fussing and protesting that she hadn't practiced, and then brightening the whole house with the music from her little black guitar. She took me to try lessons with her guitar teacher, but I only remember going once or twice, so I'm guessing I did not show much aptitude. When I was 19 or 20 my dad tried to help fulfill my wish to play guitar. He told me to cut my nails and then showed me a scale exercise to practice on the strings, plucking as he moved along the fretboard. He made it seem effortless and fun. But when I tried, the guitar jutted into my arms and chest as I held it, and maneuvering all those strings to play a chromatic scale didn't seem worth the sore fingers it caused. In my mid-twenties I tried again, purchasing a small guitar that suited my hands fairly well. I learned four chords and could haltingly play a few songs. I asked my husband, who I was dating at the time, to help me learn a Credence Clearwater Revival song. An hour later we had broken up, and I had resolved never to touch a guitar again. Then came this summer, when I taught sumer camp at Fairyland and found out that one of the other teachers is also a musician, and lives in my neighborhood. One thing led to another and the next thing I knew, I had booked a lesson. A ukelele lesson. 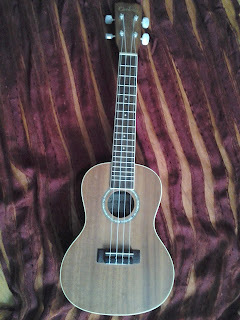 My new ukelele has four easy-to-press strings and weighs less than a pound. I can wrap my fingers all the way around its neck. Yesterday I had my first lesson, and it was the first time I truly felt successful with a stringed instrument. All day I sang my favorite songs, imagining the happy strum of my ukelele that would soon sing along with me. Later that night I practiced the transition from C to G7 until I could do it without peeking, then played a triumphant Row, Row, Row Your Boat. 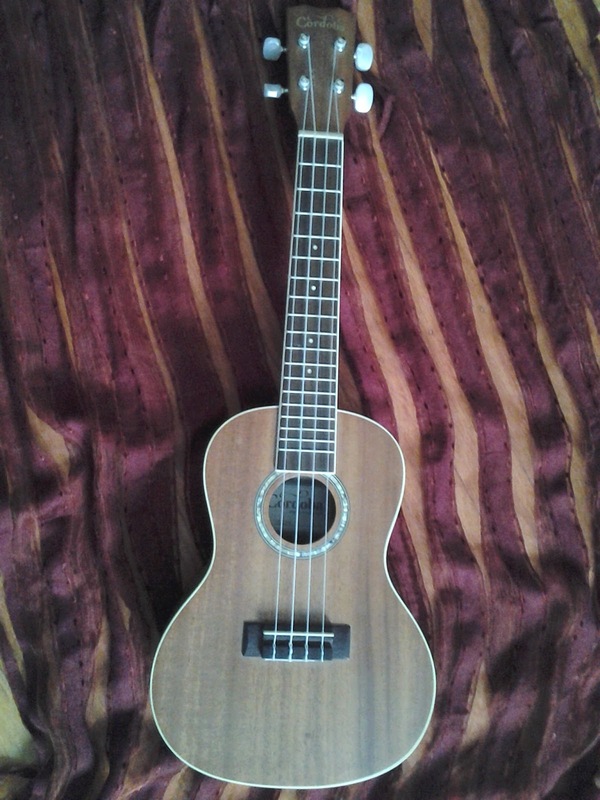 It might be too early to tell, but I think my ukelele and I will be friends for a long time.